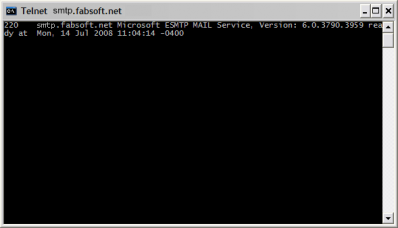 Reform can send emails by communicating with SMTP or Exchange servers. Emails can contain text, html, or attachments. Combining Reform with an email server allows the delivery of documents processed by Reform to various recipients. By sending the information via email, paper costs are reduced while delivery and response delays are decreased. 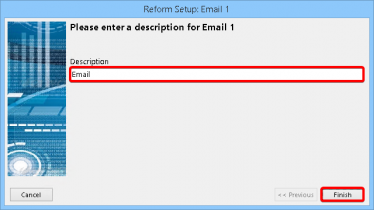 To install the Email Plug-in to your existing Reform installation, download and run the Reform-Email installation executable. The installer will launch. There is no pre-configuration required to install the Plug-in, so click Next and the process will begin. It will install SQL Server Express unless another Reform product previously installed it. This typically takes between 10-20 minutes between downloading the application and installing it. If the required Microsoft .NET Framework version is not already installed on your system, it will be automatically downloaded and installed. After the installation is complete, click Finish. The Email Plug-in is now installed. When evaluating Reform, the Plug-ins will also be in an evaluation mode for that period of time. Once Reform has been purchased and licensed, the required Plug-ins must also be licensed in order to continue functioning correctly. 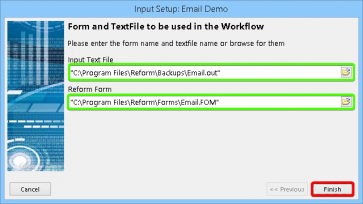 The Reform Email Plug-in integrates with multiple email server types. It currently has the ability to communicate seamlessly with SMTP, Exchange and Office 365. When configuring your email workflow using the Workflow Designer, you will be given the option of choosing the email server type you would like to configure. Depending on which type is chosen, you will be prompted for different required and optional email server settings. Setting up a new or existing form to connect to an email server and send emails is a simple process that utilizes the Workflow Designer, a form creation and configuration tool. The setup will allow you to set static (unchanging) values for various fields (such as the subject line, message body, recipients, etc), or you can use text objects mapped in the text layer to dynamically change values. To start the tutorial, the VDP Designer must be opened. To open it, go to Start > Programs > Reform… > Variable_Data_Printing > VDP Designer. 1. For the example, we will be creating a new form with an existing template. Go to File > New > New. Select the Email.FTM template and click OK.
2. When it asks if you would like to open a text file for designing, select No. 3. Next, go to File > Save to save your form. Name it Email.FOM. 4. You can now close the VDP Designer since we have a form which we will be used with the Workflow Designer to route the document. 5. *Now that we have our form, we can begin to configure the desired Email workflow using the Workflow Designer. First, the Workflow Designer must be started. 6. To open it, go to Start > Programs > Reform… > Workflow Designer. 8. 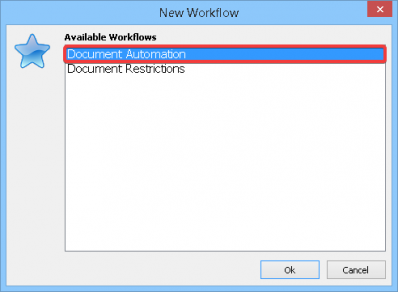 Select "Document Automation" and click Ok.
10. We can now start adding the necessary components to the workflow. First, drag and drop a Form and File object onto the workflow by clicking and holding your mouse on Form and File and then moving your mouse over to the workflow and releasing the mouse button. 11. Enter a description for the object you just added. This is done by typing in the provided box. Type "Email Demo" and click Finish. This will take you back to your workflow. 12. Now we are ready to configure the "Email" form and input file. To do so, right click on the newly added object and select "Configuration…" or simply double-click it. 13. You are now presented with the Input Setup window. First, we want to select the TextFile or data stream that our form will be using. To do so, you can simply begin typing in the box, or you can browse to find it. We want to select the Email.out file which is located in the \Reform\Backups directory. Click the small folder icon to bring up a window which will let us choose that file. Select the file and click Open. 14. After choosing the text file, you are taken back to the Input Setup page so that you can now select a form. 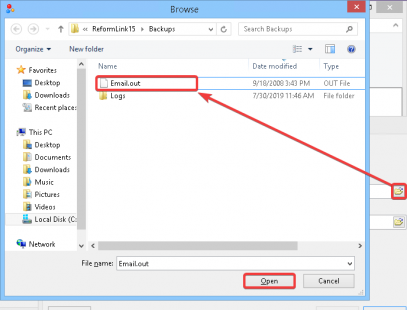 Click the small folder icon to bring up a window which will let us choose the desired Email.FOM form file. Select the FOM file and click Op'''e'''n. 15. 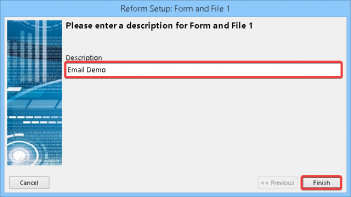 Now that you have both your Input Text File and Reform Form selected, the setup of "Form and File" is complete. You can quickly double check that the correct files are selected and then click Finish. 16. You will also be prompted to add a page-break field to the forms. At this point, we want to select No. 17. To finish the Email workflow, we want to add an Email Output. We use the same drag and drop procedure as with the "Form and File" (see step 9). Take your mouse and drag the Email object from under Output onto the workflow somewhere below your Input. Once you release your mouse, you will be prompted to describe Email. Type "Email" in the box and then click Finish. 18. Once you click Finish, you are taken back to your workflow. Your Email will have a Red Caption because it is not yet configured. 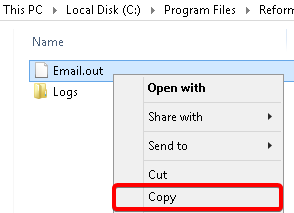 To configure Email, you must first connect the "Form and File" object titled "Email Demo". To do so, first select the "Add Connector" button from the menu bar. Next, drag your mouse from the small "x" underneath "Email Demo" to the small "x" above "Email" as pictured below. When the connection is complete, the connecter will turn black (if red, connection has not been made correctly, try again) and the "Email Demo" caption will turn green. 19. You will be prompted to configure Email upon completing the connection. Click Yes. If you click No, you can also double click on the Email object or rightclick on the object and select "Configuration…" at a later time. This configuration will step you through all the settings necessary for Email to work with your email server. The first piece of information is the file type you want your email attachment to be. Select "PDF File" and click Next. 20. You are then prompted for the Email Server Type. Using the drop down box, you can choose which email server type you will be using to send out emails . Depending on the type that you select, you may be given different email server options. 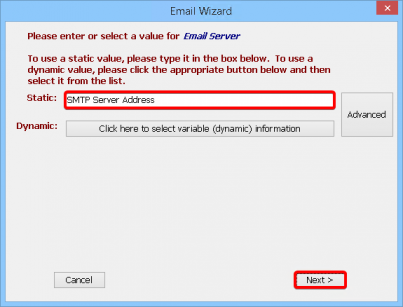 For demonstration purposes, we will be selecting SMTP. 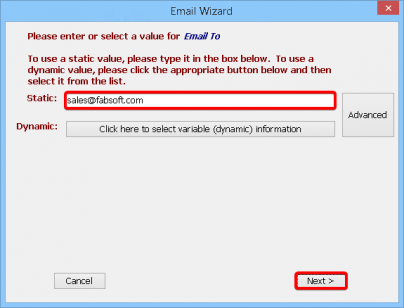 Click Next once you have selected your Email Server Type. 21. For the example, we will be using data that is already present on the print stream. Some of the information you will need to enter will be dynamically populated directly from objects mapped on the text layer. The following screen will ask you to enter the address of your Email Server. 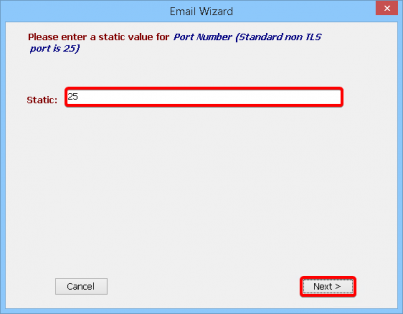 Since this is a static value, you can manually enter your Email server information. Click Next. 22. You are now prompted for the SSL Enabled. 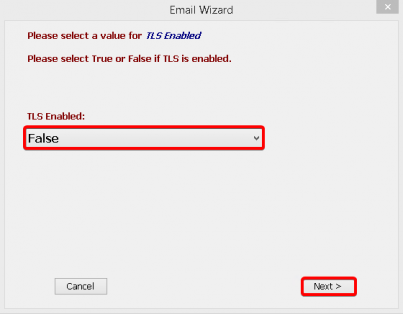 Please select True if SSL is enabled or False. Click the Next button to continue. 23. You are now prompted for the Port Number. Please enter the value for the Port Number. Click the Next button to continue. 24. The next screen will ask you for the Email User Name. If your Email server requires authentication, enter the username now and click Next. If it does not require authentication, click Skip. 25. The next screen will ask for the Email Password. Again, if your Email server requires authentication, enter the password here and click Next. If it does not, you can click Skip. 26. The following screen asks for the email address that the email will be sent from. Here we would like to use data that is available in the data stream instead of a static value. To do so, we first must click the "Click here to select variable information" button. 27. *Note-After doing so, we see that a list will appear with the different fields that you can choose for your variable data. If you want to go back to static input mode, you can do so by clicking the appropriate button for static information and then typing it in. 28. Now we want to use ContactPersonEmail as our "Email From" value. Select ContactPersonEmail from the list. You will have to scroll down to see it. Click Next. 29. The next screen will ask for the email address that the email should be sent to. Enter an email address that you can check (Ex. your own personal email address). Click Next. Note: Multiple Static addresses can be separated by a semicolon ";"or a comma ",". 30. Next, it will ask you to enter email addresses for Carbon Copies. Click the Skip button. 31. Next, it will ask you to enter email addresses for Blind Carbon Copies. Click the Skip button. 32. Next, it will ask you to enter the Return Email Address. Click the Skip button. 33. Next, it will ask for the email Subject. Select the object Remark. To select an object, first click "Click here to select variable data" and then the object list will be shown. You will have to scroll down to see Remark. Click Next. 34. Next, it will ask for the file name of the attachment. Enter the value EmailBill. Click Next. 35. The last screen will ask for the message body of the email. We want to select the object BillingNote. To select an object, first click "Click here to select variable data" and then the object list will be shown. Select BillingNote from the list. Click Finish. 36. You have completed configuring your simple Email workflow. Your 2 objects ("Email Demo" and "Email") should both be green meaning they have been successfully configured and the workflow is ready to be created. on the menu bar. After execution, you will be notified of the configuration that has taken place. Click OK.
38. You can now close the Workflow Designer. When prompted, you may save your workflow so that you can go back to reconfigure it at a later time. Your form has been saved in your default forms directory. 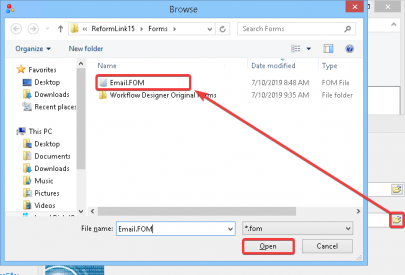 A backup of your original Email.FOM file has been copied to the "Workflow Designer Original Forms" folder in your forms directory. 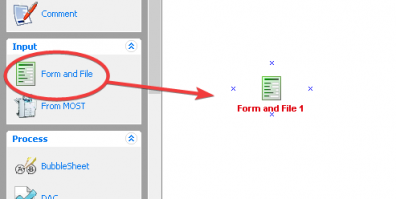 Any permanent form changes should be made to this original form as it is used throughout the form configuration process as a template. If any updates or changes are made to this template, you must execute the workflow again for your changes to appear in the forms. 39. To test out your settings and make sure that emails can be sent, first the Spooler should be started by clicking Start > Programs > Reform… > Reform Spooler. Once it is open, press the Start button. 40. Navigate to your \Reform…\Backups\ directory. Select the Email.out file, right click the file, and select Copy. 42. When the Spooler Application begins processing the file, you will notice the file name change to something similar to the image below. Once the document is emailed, the demonstration is complete. If you are not getting your output, Reform Spooler might not have the correct permissions to process the file. Please see the Reform manual for more information. You can re-test the document by copying the file from the backup directory to the spooler directory again. 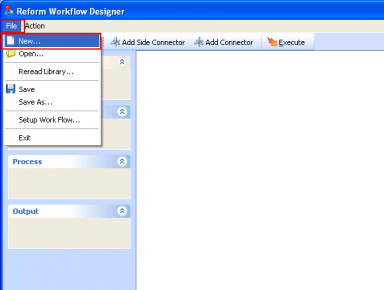 You can also create a new form and configure it using the Workflow Designer. The email should be sent to whichever address you entered for the EmailTo during the configuration with the Workflow Designer. The time it takes for the email to be sent will vary depending on the speed and workload of the email server you are using. If you do not receive an email after a minute or two, verify that the RM_Email_Monitor service is running and has the correct service logon account. For more information about the service, please see the Reform Email Monitor Service section. If the service is running and you’re still not receiving emails please refer to the Troubleshooting section of this manual. This concludes the basic setting up and sending of an email. To experiment with more advanced options such as carbon copies and blind carbon copies, read on to the next section to learn about different fields and how you can work with them to perform more advanced email operations. The setup wizard can be run by going to File > Page Setup, and then by clicking the Setup button in the bottom of the window under Send To Devices. You can also access this setup by using the Workflow Designer to reconfigure the objects you just added. Email Server – This is the name or IP address of the email server that emails will be sent from. Email User Name – If your email server requires authentication, the user name to authenticate with is entered here. 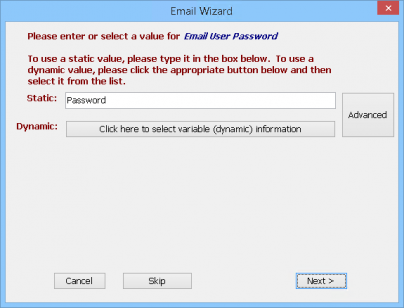 Email User Password – If your email server requires authentication, the password to authenticate with is entered here. Email From – When a user receives an email, this is who the email will appear to have been sent from. Email To – The email address that the email will be sent to. If you are entering multiple email addresses, separate them with commas. For example: user1@YourDomain.com, user2@YourDomain.com, user3@YourDomain.com. Email CC – In this field, one or several email addresses may be entered to have the email carbon-copied to different email addresses. Email BCC – Same functionality as Email CC, except this will blind carbon copy everyone on the list. 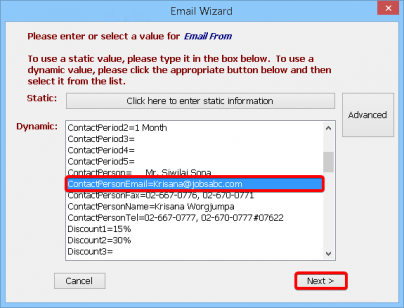 Separate multiple email addresses with a comma. 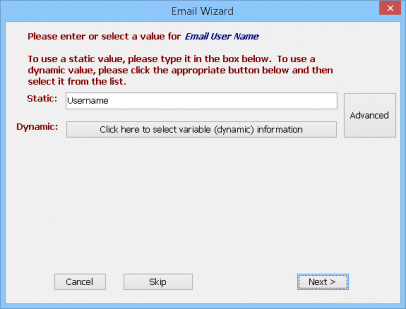 Return Email – Specifies the return address when a user replies to an email they received from the Reform Email Plug-in. Subject – Specifies the subject of the email that will be sent out by the Email Plug-in. 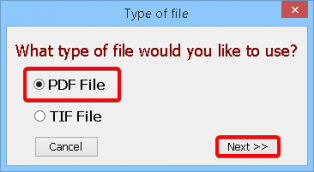 File Name – Sets the file name of the email attachment. Notes – The message body of the email. The following is a list of available email fields. These fields are found under the Special Fields menu. 1. 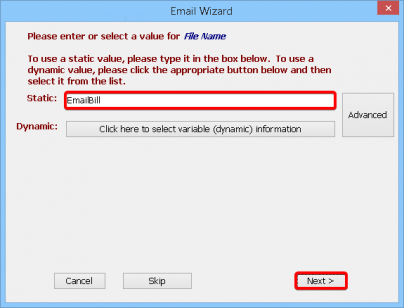 EmailTo: This field is used to capture the email address of the recipient. This can be used on the Text Layer or on the Design Layer. When used on the Text Layer, it will use the email address that this object highlights. When used on the Design Layer, you can supply a static email address, or use the Company Look-up option to fill in the email address. Please see the Reform Manual for more information about Lookups. 2. EmailFrom: This field is used to supply a specific sender’s email address. This object can be used on both Text and Design Layers. 3. Subject: This field is used to supply a subject for the email. 4. Notes: This field is used to include any information that you may want to add to the body of the email. 5. Company Lookup: This field is used to find an email address and other information in the Lookup Database. This field can be used on the Text or Design Layer. If the EmailTo field is empty, Reform will use the Lookup Database to find the email address. If you wish to use only the Lookup Database, place the EmailTo field in the Design Layer and remove the text information in the object. System Specific Fields: Some systems have fields that will need to be added manually. To add the fields manually, add a Design/Linked Text Object to the appropriate layer and rename the text object accordingly. For more information on the system specific field, please refer to the email system’s respective section. Note: The Email plugin uses the SQL Table Reform_Email_Trans. This table includes a column named HTMLBody, which has a nvarchar(4000) limit by default. If desired, the column may need to be increased to nvarchar(MAX). By default, the Email script checks for a template file at the path: Reform\Plugins\Email\Custom_Email_Body.txt . This template can be used to create an email template that is populated with values from the Reform Designer. To create a template, save the body of the email as desired. Anywhere a variable should be inserted, use the syntax: |VariableName|. Reform will automatically insert the value of the variable into that section of the body. A Sample Template is below. 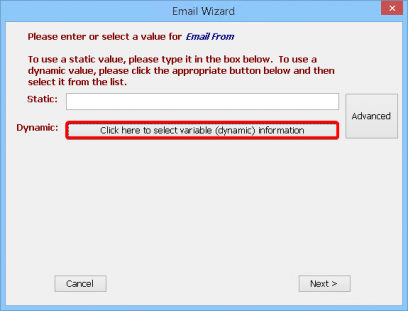 In this sample, the _Account variable will appear in the email body. Note: If multiple templates or email types are required for your environment, it is recommended to create a separate/customized Email send to script to help keep each workflow isolated. For more information on creating a custom email script, click here. If the email body (the "Notes" field in Reform) begins with <HTML> and ends with </HTML>, the script is designed to automatically switch the email to send as HTML instead of Plain Text. The footer will no longer be attached to any emails, and the HTML tags in the "Notes" field will now trigger the email to render as an HTML document. Once the script is adjusted to exclude the default footer, the Notes field can be customized to include the HTML content. 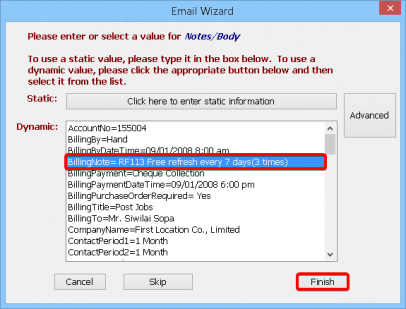 The RM_Email_Monitor service is installed by the Email installation routine. This service monitors a database table that is populated by the Email send to script in order send emails. Using this method, a record is kept of all sent emails. Also, emails can be resent automatically if they failed to be sent to the email server. To change the service logon account, go to Start > Programs > Control Panel > Administrative Tools > Services. Right click on RM_Email_Monitor and select Properties. Navigate to the Log On tab. Here, you will need to set the local administrative service logon account. Select the "This account:" option. You can manually enter the account credentials or use the Browse… button to search for one. Once you have entered the correct credentials, click OK to save your changes. If the service is already running, it will need to be restarted by stopping and starting the service. If the service is not started, please start the service after configuring an administrative logon service account. Any issues can be investigated by looking in the windows event log. There are certain directories and SQL tables that need to be monitored for growth along with the Email Plug-in for Reform. As a system processes more and more jobs, the size of these directories and SQL tables can grow very quickly. Overall system performance can be affected by the large amounts of space that the files may take up. Also, there exists a 10GB database limit if using the Microsoft SQL Server Express supplied with this installation. Obsolete files/database entries should be deleted according to your needs and file retention specifications. Q: The SMTP server cannot be reached. 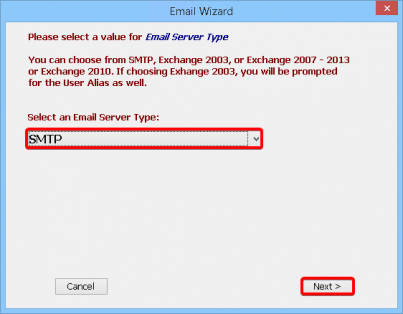 If you cannot connect to your SMTP server on your SMTP server’s port, then the server is not reachable from the Reform server, and as such, the email will not be able to be sent. Q: The SMTP server is rejecting my authentication username/password. A: Be sure that the username and password are entered correctly on the form. To do this, open up your form in the VDP Designer. Click on the EMAILUSERNAME field. If the text needs to be edited, go to the object properties section and select the text property. This will allow you to enter the text value for the field. Enter the correct text. (You can also, right-click on the EMAILUSERNAME field and select edit text in the drop down menu.) Follow the same procedure for the EMAILUSERPASSWORD field. Once done editing save the changes to the form in the VDP Designer. Q: Where can I view the Exchange 2003 webmail interface? Q: Nothing is happening after the form is processed. How can I determine the cause of an issue? A: Check the Event Log for errors related to Reform or the Reform Email Service. The Event Log can be access by going to Control Panel > Administrative Tools > Event Log. This will usually give you a good idea about why the emails might be failing. 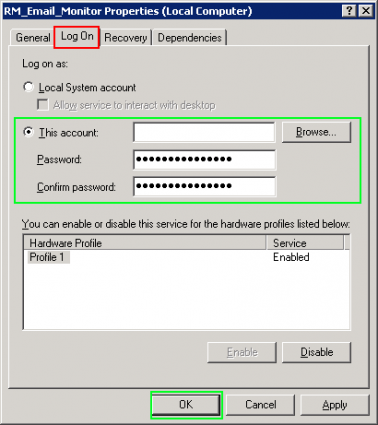 Note: If the error below occurs, Go to Control Panel > Administrative Tools > Services and try using a different account to run the ReformEmailService, such as your windows local administrator account. 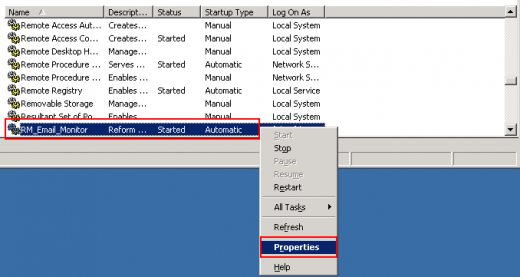 To change the log on information, right click on RM_Email_Monitor > Properties > Log On tab and type in the account you want to use. Click Ok and restart the service. Also, you can log onto windows as the service account. Q: Emails are not being received; no authentication is required on my SMTP server. A: Check the relay settings on your SMTP server to ensure the Reform server has the appropriate permissions. Also make sure that any fire/anti-virus software is disabled. *Is the user able to send emails from their workstation to someone on the Domain? yes / no Off the domain? This page was last edited on 12 November 2018, at 17:53.